Repeater pipette controllers are a fantastic addition to the cell culture kit. When performing cell culture scientists use pipette controllers during many steps of the process and a repeater pipette controller can make these steps much more efficient and save the user time. Repeater pipette controllers also eliminate time-consuming and inconsistent meniscus eyeballing – they do the work for you! 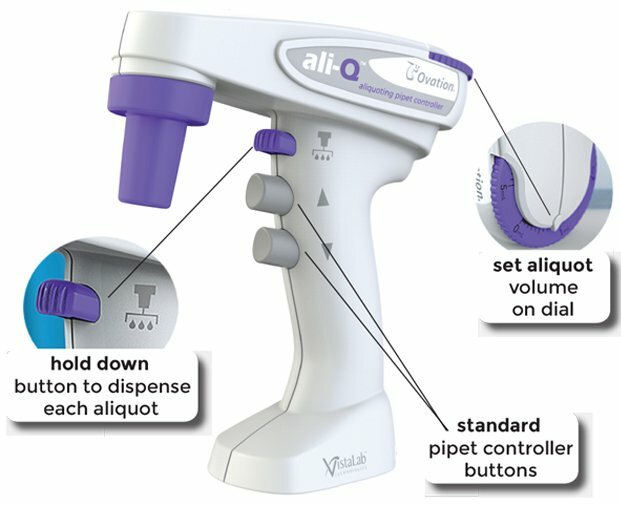 One great repeater pipette controller to add to your cell culture lab is the VistaLab ali-Q Aliquoting Pipet Controller. VistaLab Pipettes are the innovators behind the MLA and Ovation Pipettes. MLA Pipettes are ideal for clinical work and have been a laboratory tradition for over 4 decades. They are available in 3 models and cover a volume range of 10 to 100 uL. Ovation Pipettes are known for their amazing comfort, exceptional accuracy, and flawless tip mounting. The design of the pipette allows for decreased tension to the neck, shoulder, and elbows which drastically reduces the risk of repetitive strain injuries. How does the VistaLab ali-Q Aliquoting Pipet Controller work? 1. Simply turn the aliquot volume set dial to the volume you wish to repetitively dispense. 3. Finally, press and hold the purple aliquot button to dispense each aliquot.